Mobile Internet in 2014: How Many Gigabytes Of Data Do You Need? In the last few years, web pages and apps have ballooned in size. In 2014, how many gigabytes of data do you actually need? One of the most common questions I’m asked by readers of the blog is how much data they need when choosing a new smartphone tariff. Many people get bamboozled by the large choice of data allowances: you can now choose a tariff with everything from 100MB to 50GB of data. There’s also a couple of unlimited data deals from Three, giffgaff and T-Mobile. With the introduction of 4G, things have intensified in the area of mobile download allowances. Whereas 500MB per month used to be a standard data offering, 4G mobile tariffs are now widely differentiated in the amount of included mobile data. On their 4G plans, EE offers between 500MB and 50GB of data. O2 offers between 1GB and 8GB per month whereas Vodafone offers between 3GB and 9GB. On the three networks, calling and texting is now free and unlimited on most 4G Pay Monthly tariffs. Three is the sole network offering all-you-can-eat data with 4G on most of their price plans. With download allowances becoming the next big battleground, I wanted to revisit the topic and to look at how much data is required in 2014. In the summer of 2010, Ken’s Tech Tips produced the first version of our mobile data guide. Back then, we looked at the meaning of 500MB and 1GB allowances. We gave a rough estimate of how many web pages you were able to view using your allowance. Although the guide has been updated several times, it’s now time for a radical overhaul. In this article, I’ll discuss my most recent findings. It’s a little bit technical but hopefully it’ll give some background on how our data estimates are calculated. A key element of mobile data consumption is browsing the internet and accessing web pages on your smartphone. 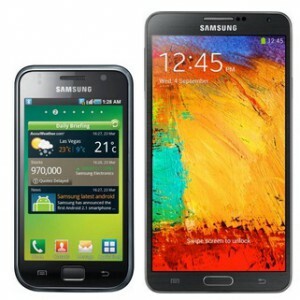 From then until now: the Galaxy S (2010, left) and Galaxy Note 3 (2013, right). Mobile websites have taken advantage of higher-resolution displays and more powerful processors. In 2010, when we wrote the first version of our smartphone data guide, we assumed a “basic” mobile web page to be 100KB in size. 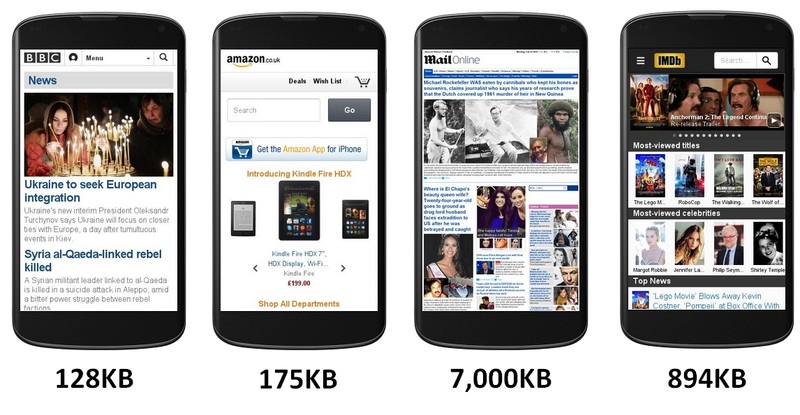 For a “rich” mobile web page (incorporating multimedia such as photos), we assumed the average size to be 330KB. Based on these figures, we determined that a 500MB allowance would allow you to view 5,000 basic web pages or 1,500 rich web pages. In 2010, smartphone technology was still in its infancy. Compared with today, the smartphones of 2010 had much slower processors. They also had smaller displays at a much lower resolution. Given the limitations of 2010’s mobile technology, most mobile websites were heavily cut down from the full desktop version. They were often focussed primarily on written content with perhaps only a couple of small photos. In the years since, mobile web design has changed a great deal. We’ve got faster smartphones and faster internet connections. As a result, mobile web pages now contain more multimedia and interactivity than before. The move towards responsive web design has also led to more complex mobile web pages and larger download sizes. With such a large change in how mobile web sites work, it’s important to re-evaluate our previous assumptions about download size. For some real world statistics about the mobile internet, I’ve turned to the guys at Mobile HTTP Archive. Since June 2011, they’ve been using an iPhone to access the world’s most popular mobile websites. They do this about twice every month crawling the top 5,000 websites as determined by Alexa. 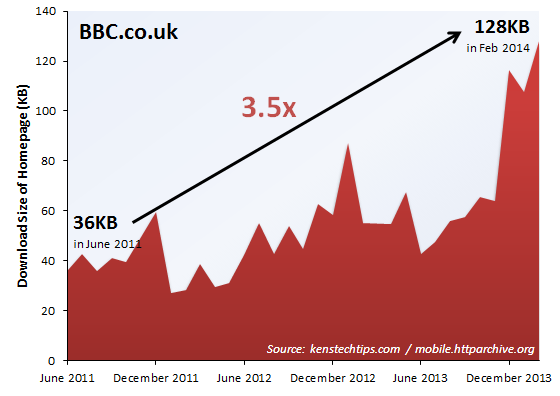 Plotting the average size of a mobile webpage over the last two and a half years, we see a clear upward trend. In June 2011, a typical mobile web page would have used 207KB of your download allowance. Today, that figure has gone up to 558KB: almost three times higher than before. You’ll consume more than half a megabyte of data for every web page you visit (558KB = 0.558MB). The median size of a mobile web page has grown from 207KB (June 2011) to 558KB (February 2014). Original data was collected by HTTP Archive Mobile. 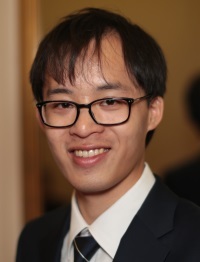 Analysis and graph by Ken Lo. See the full spreadsheet for mean, standard deviation and median web page sizes. With the average web page now weighing in at 558KB, it’s looking as if we should review our previous assumptions about the size of a mobile web page. We’d now expect a 500MB allowance to correspond to 900 web pages (30 web pages per day). A 1GB allowance will correspond to 1,800 web pages (60 web pages per day). Going forward, we predict the average mobile web page to be 800KB by the start of 2016. If you’re signing up to a two-year mobile contract, it’s worth being aware that web pages are likely to continue growing in size. By 2016, a 500MB allowance will only allow you to view 625 pages (20 web pages per day). A 1GB allowance will allow you to view 1,250 pages (40 web pages per day). N.B. We’ve used the median web page size rather than the mean (the mean web page size is reported on the HTTP Archive Mobile site). We believe the median is more representative of a typical web page and reduces the skew caused by a couple of large websites. 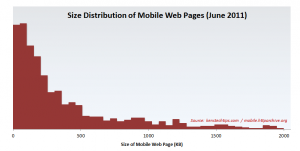 Another key finding is the changing distribution of mobile web page sizes. Compare the following two histograms. On the left, we’ve shown the distribution of mobile web page sizes in June 2011. On the right, the same distribution is shown for February 2014. In February 2014, there’s a much larger spread in mobile web page sizes. When visiting a random website, there’s a much larger chance it’ll eat a substantial amount of your data allowance. In almost a third of all websites (30%), you’ll now eat up more than a megabyte of your download allowance by simply opening the page. Ouch. Distribution of mobile web page sizes in June 2011 and February 2014. On the horizontal axis, we’ve shown the graph only between 0KB and 2000KB (2MB). 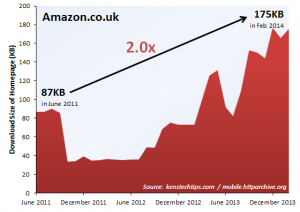 The long tail of pages larger than 2MB has been omitted for the graph for greater clarity. Original data was collected by HTTP Archive Mobile. Analysis and graph by Ken Lo. Comparison of statistics. Download size for mobile web pages in June 2011 and February 2014. Source: Ken’s Tech Tips & Mobile HTTP Archive. The current version of our article on download allowances considers a “basic” web page to be 100KB in size. A “rich” web page is considered to be 330KB. We believe these estimates now need to be updated. The message is simple: data consumption is now much more unpredictable when browsing the mobile internet. In almost a third of all cases, you’ll consume more than a megabyte of data when visiting a web page on your smartphone. As mentioned previously, there’s a large variation in the size of different websites. As a general rule of thumb, websites with mainly text-based content will consume less data. Websites with rich multimedia will consume a lot more (e.g. look out for websites that have photos, videos or music embedded). Your data allowance will go a lot further if you stick to sites with less multimedia. As part of our study, we looked at four popular UK websites: the BBC, Amazon.co.uk, Daily Mail Online and IMDB. For each website, we again used data from Mobile HTTP Archive. Of the four sites considered, there’s a huge variation in mobile data consumption. 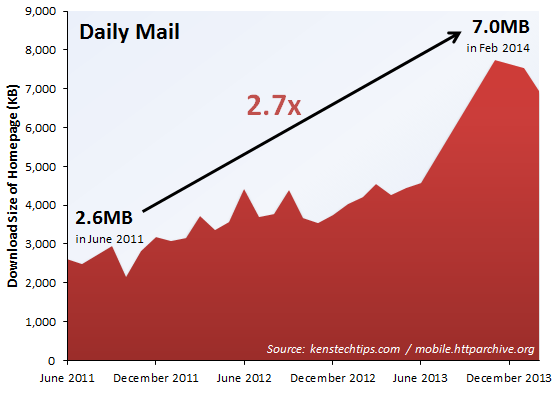 Visitors to the Daily Mail website would use 7MB (7,000KB) of data when loading the homepage. Compare this to the more lightweight BBC, where you’ll only use 128KB. With the Daily Mail site containing a large number of photos, data is consumed at a much faster rate (88% of the Daily Mail’s download size was due to embedded photos). The following table shows the amount of data consumed when accessing the four websites. For each site, we’ve compared the download size in June 2011 and February 2014. There’s a huge variation in the size of mobile web sites. Though one thing’s consistent amongst the four sites: they’ve been growing in size over the past two and a half years. Source: Mobile HTTP Archive. The total download size of four popular websites (homepage only): BBC Online, Amazon.co.uk, the Daily Mail and IMDB. Although, there’s a large variation in web page size across the sites, one consistent trend is they’re all growing in download size. Original data was collected by HTTP Archive Mobile. Analysis and graph by Ken Lo. With the on-going trend of mobile websites getting bigger, we strongly recommend mobile phone buyers to future-proof their contract. The average mobile web page is likely to be 800KB by the start of 2016. However, depending on the websites you visit, the average web page size could already be a whole lot higher. With most mobile phone contracts lasting for 2 years, you’ll need to make sure you’ve planned far enough ahead when choosing the download allowance. There’s one more thing we’re still yet to discuss. As download speeds continue to get better, the smartphone browsing experience will become more frictionless. If web pages load faster than before, the natural reaction is to visit more sites. With faster internet, it’s more worthwhile to find information online: we might Google the answers to a pub quiz or we might compare product prices online. If browsing is sluggish, we’re less likely to go through the hassle of using our smartphone. Hence, faster download speeds will lead to an even faster increase in mobile data consumption. The average time required for a web page to fully load on your smartphone. We’ve taken the size of an average web page to be 558KB (see above). For typical download speeds, we’ve assumed an average of 0.1Mbit/s (2G GPRS), 4Mbit/s (3G HSPA+), 8Mbit/s (3G dual-carrier HSPA+), 15Mbit/s (standard 4G LTE) and 30Mbit/s (double speed 4G LTE). Allowing for an increase in average web page size to 800KB by 2016, the table above shows the approximate number of web pages you can visit every month or visit every day. We’ve also converted this into an approximate browsing time using the assumption of 1 web page per minute. Of course, the table above assumes you’re only using a smartphone to browse the mobile internet. In reality, you’ll also need data for sending e-mails, downloading apps, using social networks, listening to online radio and watching videos on YouTube. Hence, you should choose a data allowance which is large enough to accommodate other activities as well as browsing the internet. 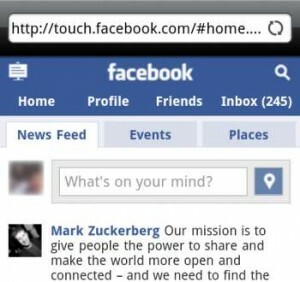 Facebook in 2010: In the past, Facebook was mainly focussed on text-based status updates. Today, it’s more about photos and multimedia. So far, we haven’t mentioned one important aspect of mobile web browsing: social networking sites such as Facebook and Twitter. Many of us use Facebook, Twitter and other social networking sites extensively through the day. It’s a major component of mobile data consumption and needs to be considered when choosing a download allowance. Although the Mobile HTTP Archive tracks both Facebook and Twitter, it doesn’t do so correctly as both websites are hiding behind a login. In order to access either the Facebook News Feed or the Twitter Timeline, you’ll need to sign in with an account. As the Mobile HTTP Archive crawler isn’t able to do this, it’s only able to measure the size of the login page. As such, we don’t have reliable figures on data consumption when using Facebook or Twitter. 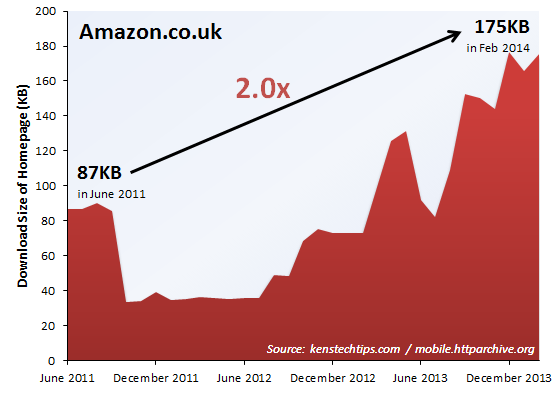 One thing’s for certain though: both sites have been growing substantially in download size over the last few years. Upon opening my own Facebook News Feed, I found it consumed around 3MB of data. This is much higher than it was in the past: mainly because most Facebook updates now contain a large image. This has been the case since May 2012 when Facebook redesigned their news feed to focus more on photos and multimedia. Going forward, Facebook has also trialled the integration of video content. They’ll be following in the footsteps of Instagram and it’s bound to cause another increase in data consumption. 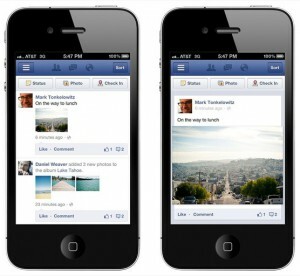 In May 2012, Facebook radically overhauled the mobile version of their news feed (old feed on left, new feed on right). The updated news feed put a greater emphasis on photos and multimedia. By moving to a more graphically-rich experience, Facebook substantially increased the amount of data consumed by their app. For Twitter, the same arguments apply. Twitter used to be a mainly text-based service: users were challenged to tweet in 140 characters or less. Nowadays, Twitter is a more visual experience with photos and videos embedded in tweets. If you’ve got any ideas on how to reliably measure data consumption when using Facebook or Twitter, it’d be great to hear from you. Finally, a couple of words on the download size of smartphone applications. 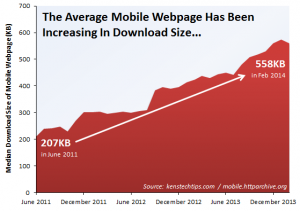 Just like web pages, apps have been growing in download size over the past few years. Today, “Retina” or high definition displays are commonplace on most high-end and mid-range smartphones. With a larger number of pixels on the screen, app developers need to include graphics at a higher resolution. Developers have also been adding extra features and functionality to take advantage of new processors. All of this leads to an increase in application download size. Two years ago, in February 2012, I did a survey of mobile app download size. Looking at the top Android apps, I found the average download size to be 6.1MB. Repeating the same analysis today, the average has now risen to 13MB. With the average application having more than doubled in size, you’ll now require a larger data allowance to download the same number of applications. 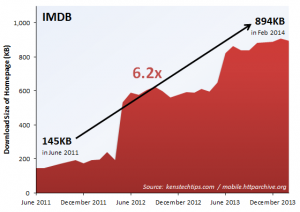 The average mobile web page is now 558KB. By 2016 (when most of today’s mobile contracts will end), the average web page size is likely to rise to around 800KB. Today, there’s a larger variation in the size of mobile websites. 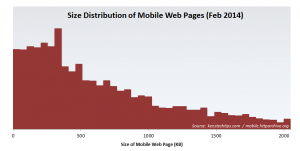 30% of mobile websites are now larger than 1MB. 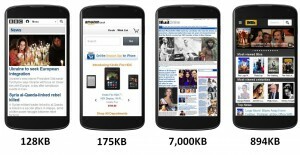 Because of greater variability in web page download size, it’s much more difficult to know how much data you’re using. 4G internet and faster data connections mean the number of web pages downloaded will increase in the future. With 4G, the average web page will load in 0.3 seconds. This compares to 1.1 seconds when using 3G technology. It’s difficult to obtain reliable figures for data consumption when using Facebook or Twitter. Anecdotal evidence suggests you can easily use up several megabytes by opening the Facebook News Feed. 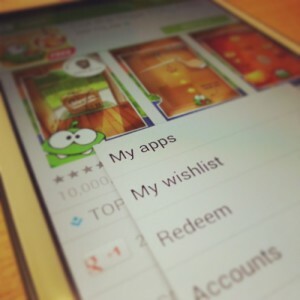 The average smartphone application has now risen to 13MB in size. It’s more than doubled in the last two years. In the coming weeks, I’m looking to use the findings here to update our article on mobile download allowances. In the mean time, it’d be great to hear your feedback and your thoughts on mobile data. Are you worried about mobile data consumption? Have you any suggestions on how we can improve the study here? How should the UK mobile industry better explain data consumption to users? Please leave your comments at the bottom of this page: it’ll be great to hear from you! 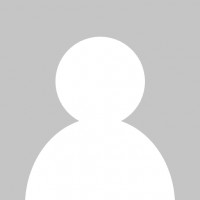 The data for this study comes from HTTP Archive Mobile. HTTP Archive Mobile is an open source project: you can download the original data set here. Clear and concise as always. Many thanks Ken. ATB for 2015.